I hope everyone had a great Easter. 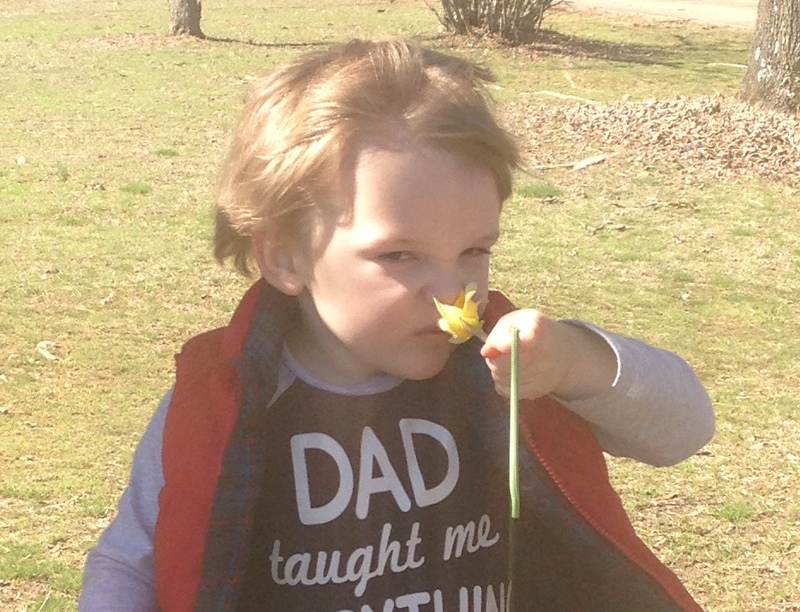 Little Caleb absolutely loved seeing family and hunting eggs. We had a great time! This week it’s back to the grind of getting ready for the April 21-22 Bella Rustina in Conway. I got my big banner out for putting at the Conway Expo Center and was reminded that last year I had the actual date of the event put on there. 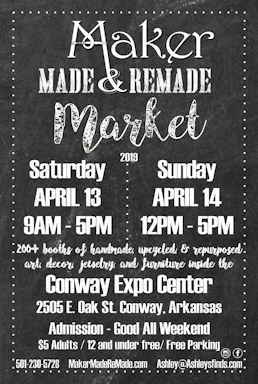 I contacted Crossman Printing in Conway and they were able to update the dates on my banner so I didn’t have to buy a new one. The colors of the banner and the vinyl they used was almost an exact match – The banner turned out so good! I immediately took it out to the Conway Expo Center. It’s an 8’x4′ banner, so I have to use sturdy posts and a post driver to put it up. As I put the banner up, Little Caleb entertained himself by running around and playing in the dirt and rocks. He is finally potty trained, but is just now realizing the fun of “going” outdoors. I had my back to him as I was driving one of the posts into the ground and looked back every few moments to make sure he wasn’t getting too close to the road. One moment he was sprinting up and down the hill we were on and the next I turned around to see him pants down, shirt under is chin, back arched, peeing away in front of the gazillion people driving by on Hwy 64. Of course I stopped everything and yelled to him to not do that, but by the time I got to him he was done and proudly pulling his pants up. He was a good 50+ feet from the road and with all the signs and banners I’m hoping not many people saw him, but I can imagine the few that did probably got a chuckle. A gazillion great events are happening this weekend in the Little Rock area. Due to the weather forecast, The Painted Tree has moved their tent sale to next weekend, April 13-14. The Lions Club Uptown Downtown Market & Bazaar will be in Downtown Little Rock at 5th and Main Saturday from 9:30AM-4PM. Admission is free. 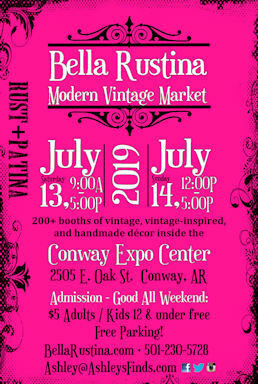 Enjoy Art/Crafts, Vintage Items, Food Trucks, Live Music, Aviation Demos, and various Local Vendor Booths. Great sale with lots of good, clean vintage! Women’s jewelry – costume & fine, Gorham sterling flatware 53 pieces of Camillia, framed art throughout the house – several very nice originals, small curio cabinet, hand – thrown pottery, lift recliner, narrow hall table, side tables & chairs, lamps, rugs, mirrors, sofas, book cases, books, bric-a-brac, brown leather neail-head wing-back with ottoman, wing-back recliner, panel TV with built-in Blue Ray player, small Mid-Century Modern dining table with 2 leaves, 6 Mid-Cent. Mod. chairs, lit china cabinet, Mid-Century Mod. chest/buffet, serving pieces, stemware, crystal, depression glass, square Mid-Cent. Mod. table, great kitchenware – vintage AND new, desk, bedroom suits – twin, full & queen; ladies’ handbags, clothing, shoes & accessories; home office supplies; old Sony stereo system with turn table, cassett, receiver; Oreck vac with attachments, holiday decor, Brother sewing machine with case, linens, cedar chest, yard tools, hand tools, outdoor bench, pots, window boxes, and more! Word of caution: Parking on Rodney Parham is restricted so please park carefully. The driveway is steep and we will have someone to assist you. Do not let the parking or driveway deter you – this is an awesome estate tag sale. FORMAL DINING ROOM: Century Furn Co. “Chen Hua:” Parson’s table & 8 chairs & china cabinet, Cambridge Rose Point crystal – footed servers, relish, wines, ice teas, cream/sugar…, embossed vases, oriental artwork, …..
MASTER BEDROOM AND BATH: Louis XV style French Provincial bedroom set – full size head/foot board – inlaid marble squares dresser w/ mirror – pair end tables & bachelor chest, carved armchair, patina metal framed glass-top coffee & side table, framed artwork, accent decor pcs., luggage, steamer, full mattress set, 620 Stevens Browning rifle…. OFFICE: Globe-Wernicke bookcases, oak library table, (2) oak & leather side chairs, executive desk, file cabinets, old Miss memorabilia, mantle clock, artwork, office misc….OFFICE: Globe-Wernicke bookcases, oak library table, (2) oak & leather side chairs, executive desk, file cabinets, old Miss memorabilia, mantle clock, artwork, office misc…. The house and garage are full!!! ANTIQUES, FURNITURE, WROUGHT IRON PATIO SET, COSTUME JEWELRY, INCLUDING 5 NICE WATCHES; STAINLESS SIMPLE HUMAN TRASH CAN, PLASTIC SLIM SIMPLE HUMAN TRASH CAN, OTHER KITCHEN ITEMS, ANTIQUE MANTLE CLOCK. ROWE POTTERY, FRANCISCAN DESERT ROSE CHINA WITH SERVING PIECES, ANTIQUE PIANO STOOL, ANTIQUE MAHOGANY DINING TABLE & CHAIRS, ANTIQUE OAK TABLE WITH CHAIRS, CHINA HUTCH, BUFFET, ANTIQUE WARDROBE, KING BEDROOM SUITE, LIKE NEW KING TEMPUR- PEDIC MATTRESS SET, KING MATTRESS BEDDING, SEWING MACHINE, LIKE NEW WHIRLPOOL 4 DOOR FRENCH DOOR STAINLESS REFRIGERATOR, PR OF 1985 KLIPSCH SPEAKERS, PRACTICALLY NEW SAMSUNG FRONT LOADING STAINLESS WASHER & DRYER WITH STORAGE BASES. CEDAR CHEST, MINK JACKET, SOME CLOTHING, CAST IRON BAR STOOLS, SIDE TABLES, OTHER TABLES. ANTIQUE WICKER TABLE & SOFA; NICE SIDE CHAIRS, ANTIQUE SOFA, SECTIONAL SOFA. DECORATOR ITEMS, LINENS, ART WORK, DECORATOR PILLOWS, 7 X 10 ORIENTAL RUG, KEYBOARD,TREADMILL, HONDA MOWER, WEED EATERS, YARD TOOLS. Lots of high end furniture and accessories. Drexel dining table and chairs. This house is so full the sale will run two weekends! 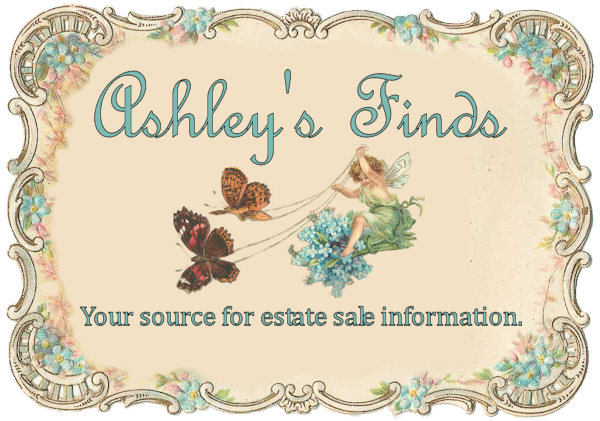 There is a large variety of items for everyday use, home decorating, resale, crafting & repurposing, collecting, staging or photo props vintage and current day. We believe this sale has one of the largest collections of Mickey/Disney memorabilia in Arkansas. If you are a collector, or want to get started this is the sale for you! There are so many NIB items and new items removed from boxes for display. With sixty years of accumulation, there is way too much to list. Dealers this is the time to stock up, collectors you will be in “collector heaven”, and if you like to entertain we have great quality pieces for you. Need a gift for someone, many of these items are new/never used and still in boxes. To everyone else there is plenty here for you here for you too! Don’t miss this one! Take J.F.K to Pontiac or Osage and follow the signs. See pictures on estatesales.net! is no way to list all these items you have to see to believe!! Just a sampling of what is there includes: antique clocks by Sessions, Roeber, Hallett, Hermele; grandfather clock; designer dolls by Himstedt, Jan McLean, Zawieruszynski; many paintings on ivory; antique pictures and frames; Mt. Washington and Wavecrest; several antique Noritake porcelain pieces; antique handkerchiefs; original art cards; concrete statuary; pottery; dishes and platters (many antique); impressive king size bed, armoire, and dresser; queen bed; pair French end tables; wood bookcases; dining room chest; mid-century modern chairs; wood office chair; occasional tables; some jewelry; books; Murray riding lawn mower, grass catcher, wagon; tools and tool boxes; wheelbarrow; gardening items; miniatures; Christmas and holiday collectibles; many antique lamps by Bradley & Hubbard and others, and so much more. Lovely sale in Centerton. Mid Century Broyhill dining table and 4 chairs. Mid Century china cabinet. Side tables and coffee table. Glass and wicker book shelf and entry table. Four Lyre back dining chairs. Hot Point washer and dryer. Queen mattress and box springs. Liberty bedside tables. Linen chest. Entertainment center. ‘70s phone table. Vintage German clothing. Glassware, crystal, Style House china set. Corning red bud dishes and Corning casseroles and nice kitchenware. Table/lamp combo. Vintage vinyl. Vintage camera equipment and projector. Vintage typewriter, linens and collectables. Metal and crystal chandelier. Willow Tree angels and more. Floor display case, Oak armoire, Mahogany corner cabinet, Llardo and Beatrice Potter figurines, Gorham “Medici” sterling flatware, Reed and Barton 4 Georges sterling flatware, lots of artwork, Signed prints, photographs, pine bookcases, books, collectables of all types, Lenox holiday china, China, crystal, glassware, crockery, leather recliners, mahogany office desk, chair, and file cabinet, Iron and brass trundle bed, sofa’s lamps, mantle clocks, basket collection, desk, chest, lots of kitchen, Household, and garage items, holiday, Dept 56 houses, lamps, linens, ladies and men’s clothing, fine and costume jewelry, electric Dryer, side by side frig, cook stove, outdoor iron patio furniture, planters and pots, PLUS!! 2006 Buick Lacrosse Sedan, Good condition, 72,000 actual miles, much more!! Small home packed full; and a Pickers Paradise in the basement and out behind the house. Items of interest are a beautiful dining room table w/thick glass and upholstered chairs, dolls, trunk by Lane. Basement area includes antique mirrors, old doors, old wood furniture, trunk, light fixtures, iron-work railings – all waiting for the artist and refinishing enthusiast to come claim. Huge on-site auction loaded with Furniture, tools, antiques, glassware, framed artwork, dvd’s, linens, decorator items, outdoor park benches, large fans on stands, shop tools, lots of nice smalls, and lots more to be added. Many more items of interest and value. Everything sold “As Is Where Is”. Cash, Credit/Debit w/3% processing fee, Checks accepted with prior approval. Not responsible for accidents or injury. Announcements made day of sale take precedent. STAINLESS REFRIGERATOR- FURNITURE- ANTIQUES: Frigidaire Gallery series Stainless Side by Side refrigerator(Very nice)- 5 Leather Bottomed High Bar Seats- Large Overstuffed Chair- Leather Bottomed Sectional(Big)- Leather Recliner- Yellow Writers Desk- Small Wooden Valet chair- Oak Cane Bottom Chair- vintage Mens Wardrobe(nice)- Maple Drop Leaf Table- Asian Carved wood Trunk- Decorative Room dividers(3)- Large Wood Edsel- Washer & Dryer- Lexington Vanity- Serta Queen Mattress set- Serta I series King Memory Foam Mattress(like new) – Vintage Wooden Chest of Drawers- Vintage Vanity- Upholstered Chairs(several)- King Bedroom Suite(VERY NICE) Bed, Dresser w/mirror, High Boy Chest, End tables- Wrought Iron Queen Bed w/canopy- XL Dresser w/mirror- Black Bar Stool Chairs- Asian Painted Wardrobe(nice)- Metal & Glass topped Table- Dining Room Chairs- Red Leather Wingback Chair- Swan Childs Rocking “horse”- Love Seats- Very Nice Sofa- Secretary Shelf- Cherry wood Desk- Oak Bedside Table- Cherry wood Cedar Chest- & MORE! SHOP & YARD: Huge Concrete Planter, Urn, and Benches- Hand Forged Hay Hook- 3 Set of Cast Iron Park Bench Ends- Vintage Victor Traps- Husky 5th Wheel Hitch(like new)- Bayou Classic Fish Cooker- Vintage Wrought Iron Metal Gates- Ammo Box- Extension Cords- Industrial Furniture dolly- Propane Tanks- Rubbermaid Lawn Cart- garden statuary & much More! HOUSEHOLD- WOMANS CLOTHES/SHOES & DESIGNER PURSES: Roll around Luggage- Bose Surround Sound Speakers- Women’s Name Brand Tops- Women’s Name brand Coats- Womens name brand Pants- Women’s name Brand Suits- Designer Purses Gucci, Lucky Brand, Coach, Big Buddha & many others- Women’s Leather boots and shoes- Paper Shredder- Crock Pot- Kitchenware- Elephant Plant Stand- Asian Vases- Candle Holders- Metal Brass Door Stop- Venetian Glass perfume Bottles- Dishes- Health Bounce Trampoline- Area Rugs- Metal Based Lamps- Polish Lead Crystal Lamps- Stereo w/speakers- TV sound setup- Vintage Compact Collection- Afghans- Costume Jewelry- many sterling silver rings w/ beautiful stones! This auction will offer the second half of good estate from Petit Jean Mountain and other consignments to include: Vintage working “Laguna Beach” & Miss America” bingo pin ball machines, large crystal chandelier, Eastlake dresser w/ mirror, several crystal pieces, Sterling silver & silver plate, porcelain, china, Oriental decor items, Cloisonne, small chandeliers, assorted antique & vintage furniture, primitive pie safe w/ punched tin paneled front, French style small table, assorted jewelry, artwork, German Cuckoo clock, & more!